A - AVAILABLE: No, been wtih my man for 22 years now! F - FAVORITE SONG: "Be Thou My Vision"
S - SONG YOU LAST HEARD: "Who Says You Can't Go Home"
Happy Birthday!!! I enjoyed your abc's. Happy Birthday. Love the A-Z birthday questions. Happy Birthday! I loved reading your list! Well happy birthday to you. I hope your day was grand. I love the new photo for the header. Amazing how your kids look so much like you. Love your answers- Happy Birthday! Love it! Happy Birthday!!! !Love love yourFamily photo! Happy, happy birthday! It was lovely to learn a little more about you - what a fun post! I hope you had a wonderful birthday! 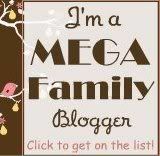 I LOVE the new pic of your children on your blog header! BTW, you are absolutely Beautiful!!! Have a great May!